Today, more and more dads like you are experiencing the satisfaction and reward of taking a more active role in the life of your child. Read and discover how these 10 simple ideas can help (or remind) you to start today on a new path—one that will impact your relationships...and your child's future. One of the best things you, as a dad, can do for your children is to respect their mother. If you are married, maybe this goes without saying, but I'll say it just in case; keep your marriage strong and healthy. Take time, as least weekly, to work on this relationship and keep it strong. If you're not married, it's still important to respect and support the mother of your children. A father and mother who respect each other, and let their children know it, provide a secure environment for the children. When children see their parents respecting each other, they are more likely to feel they are also accepted and respected. Find more on protecting your marriage. This is more complicated that is sounds, I know. But, how a dad spends his time tells his children what's important to him. You've no doubt heard us say, Children spell "love": T-I-M-E. If you always seem too busy for your children, they will feel neglected no matter what you say. Treasuring children often means sacrificing other things, but it is essential to spend time with your children. Kids grow up so quickly. Missed opportunities are lost forever. Need ideas for how to spend your time? Here are 7 Ways to Connect with Your Kids. All too often the only time a father speaks to his children is when they are getting in trouble. That's why many children may cringe when their mother says, "Your father wants to talk with you." Take time and listen to your children's ideas and problems. Listening helps them feel respected and understood. Begin listening and talking with your kids when they are young so that difficult subjects will be easier to handle as they get older. All children need guidance and discipline, not as punishment, but to set reasonable limits. Remind your children of the consequences of their actions and provide meaningful rewards for desirable behavior. Fathers who discipline in a calm and fair manner show love to their children. Get our 8 Things to Know About Disciplining Your Child. Fathers are role models to their kids, whether they realize it or not. A girl who spends time with a loving father grows up knowing she deserves to be treated with respect by boys, and what to look for in a husband. Fathers can teach sons what is important in life by demonstrating honesty, humility, and responsibility. Here's a great example of a role model dad in case you need one. Too often we think teaching is something others do at a school building. But a father who teaches his children about right and wrong, and encourages them to do their best, will see his children make good choices. 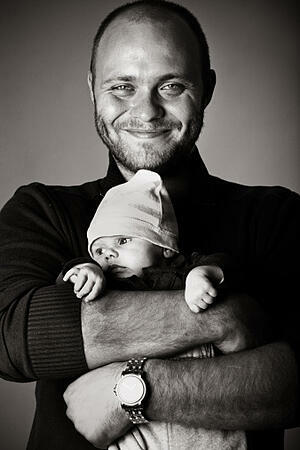 Involved fathers use everyday examples to help their children learn the basic lessons of life. Consider the vital knowledge you, and you only, possess with regard to music and classic movies at this point! Sharing a meal together (breakfast, lunch, or dinner) can be an important part of healthy family life. In addition to providing some structure on a busy day, it gives kids the chance to talk about what they are doing and want to do. It is also a good time for fathers to listen. Most importantly, it is a time for families to be together each day. In a world where television and technology dominates the lives of children, it is important that fathers make the effort to read to their children. Children learn best by doing and reading, as well as seeing and hearing. Read to your children when they are very young. When they are older, encourage them to read on their own. Instilling your children with a love for reading is one of the best ways to ensure they will have a lifetime of growth. We wrote a little something called 6 Tips on How to Show Your Child Reading is Awesome. Let's be honest, it's helpful. Children need the security that comes from knowing they are wanted, accepted, and loved by their family. Dad, get comfortable hugging your children. Showing affection every day is the best way to let your children know that you love them. Even after children are grown and ready to leave home, they will still look to their fathers for wisdom and advice. Whether it's continued schooling, a new job or a wedding, fathers continue to play an essential part in the lives of their children as they grow and, perhaps, marry and build their own families. Which one of these 10 ways do you find the most difficult? Why? 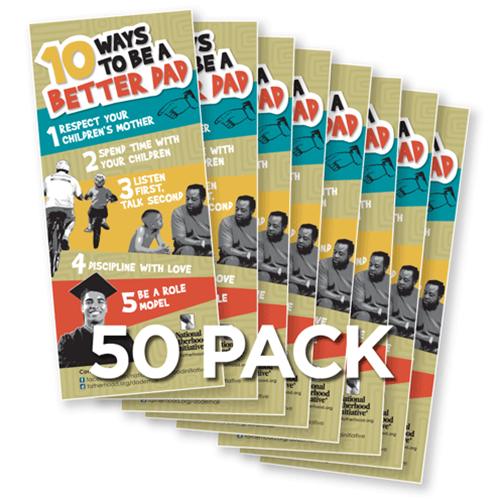 Fatherhood Leader > We have these 10 Ways to Be a Better Dad created as brochures and tip cards for you to use with your group of dads in any setting.